Hands showing signs of aging are nourished and revitalized by this skin-renewing Pomegranate Hand Cream. It’s a powerful regenerating treatment with potent antioxidants and rich essential fatty acids that restore youthful beauty to your hands. This natural cream for aging skin contains organic pomegranate seed oil which is naturally rich in antioxidants that protect your hands from free radical damage and promote skin renewal. Organic shea butter, a soothing emollient packed with essential fatty acids, renders your skin silky smooth and lavishly moisturized. Keep skin looking youthful and firm using nature's best : Weleda Pomegranate Hand Cream. 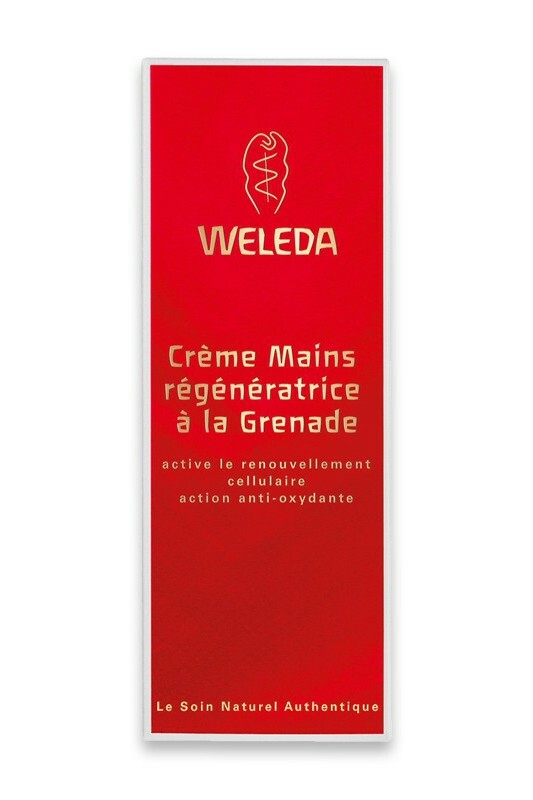 Hands showing signs of aging are nourished and revitalized by Weleda'skin-renewing Pomegranate Hand Cream. It’s a powerful regenerating treatment with potent antioxidants and rich essential fatty acids that restore youthful beauty to your hands. This natural cream for aging and dry skin contains organic pomegranate seed oil which is naturally rich in antioxidants that protect your hands from free radical damage and promote skin renewal. Organic shea butter, a soothing emollient packed with essential fatty acids, renders your skin silky smooth and lavishly moisturized. Cette crème est très confortable. A l'application elle est souple et s'étale facilement. Elle laisse un film léger non gras et les mains sont toutes douces. 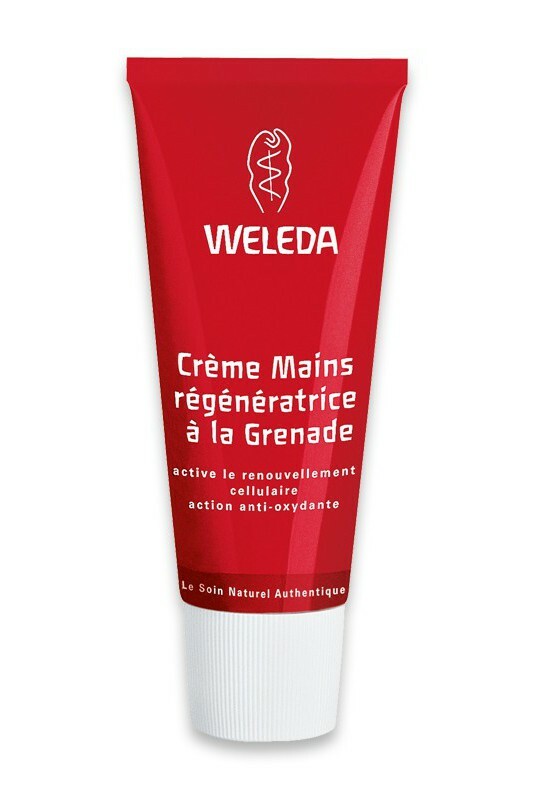 Apply a small amount of Weleda Pomegranate Regenerating Hand Cream to your hands and massage until completely absorbed. Apply as often as needed. Water (Aqua), Sesamum Indicum (Sesame) Seed Oil, Glycerin, Alcohol, Glyceryl Stearate SE, Butyrospermum Parkii (Shea Butter), Helianthus Annuus (Sunflower) Seed Oil, Stearic Acid, Punica Granatum (Pomegranate) Seed Oil, Panicum Miliaceum (Millet) Seed Extract, Ruscus Aculeatus (Butcher's Broom) Root Extract, Helianthus Annuus (Sunflower) Petal Extract, Persea Gratissima (Avocado) Oil Unsaponifiables, Olea Europaea (Olive) Oil Unsaponifiables, Xanthan Gum, Fragrance (Parfum)*, Limonene*, Linalool*, Citronellol*, Geraniol*, Citral*, Eugenol*, Coumarin*. un petit coucou, j'ai reçu cette crème qui me plait bcp, il en faut peu et ça hydrate au maximum. En revanche, l'odeur est très forte mais comme j'aime tout ce qui est lié aux huiles essentielles et les crèmes de massage chez le kiné qui m'y fait penser. J'adore. Par contre pour les gens aimant les petites odeurs de bébé ;) ou de légère odeur. Préférez une autre crème car l'odeur reste longtemps sur les mains :).